Resurrection Mary is the most often seen ghost in Chicago. She is also the most famous ghost in Chicago. She is a beautiful young woman with long blonde hair and bright blue eyes. She is seen in a long white gown and dancing shoes. Those who have seen her, describe her standing by the side of the road. Sometimes she is hitchhiking. Other times she just wanders the cold, dark streets. According to legend, Mary was hit by a car in 1930. She was killed in front of the gates of Resurrection Cemetery, where she would later be buried. She is always seen wandering by this cemetery. Countless travelers have seen her over the years. One cab driver graphically describes his encounter with Resurrection Mary in the book Chicagoland Ghosts. He describes picking her up and her vanishing from the back seat like she had never been there. One of the most famous incidents involving Mary was in 1976. 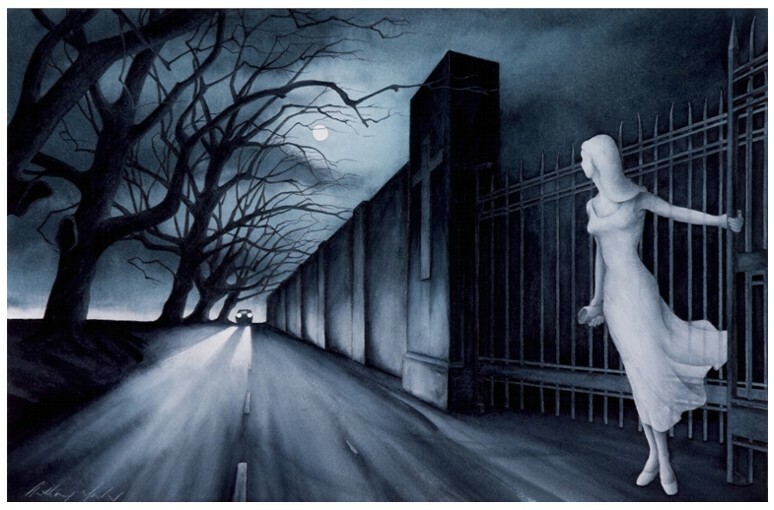 In 1976, Mary was seen by a passer by standing just inside the gates of the cemetery. The passer by did not stop to help Mary, but called the police. The police did not find a ghostly girl locked in the gates of the cemetery, but they did find a section of gate that had been bent and had small finger prints burnt into the metal. Although the gates have been fixed, her fingerprints remain on the bars forever reminding the world of Mary's tragic death. As time has passed, Resurrection Mary has been seen further and further from the cemetery. People have seen her blocks anbd even miles from the cemetery wandering in the dark. People often say they stop to pick up the lovely blonde and she vanishes like a mist, back to the world of the dead. I love that story. There's hitchhiker ghosts in a lot of cities, but hers seems to be the most reported one. Did you see her while you were there?? ?